One of the most delicious blessings of summer is the sun-ripened tomato. I know…I know. What is this? My 4th garden tomato blog? I can’t help it! There’s no getting around it! I love em! We (gardeners) race to be the first to have a ripe, juicy harvest and willingly share with friends and neighbors. The deadline for my first ripe tomato of the season is July 4th, in which I have yet to pull off. The anticipation has now worn off and the Sunday of Summer, the month of August will bring your tomato inventory to a head. So don’t be stingy! A paper bag or basket with a few homegrown tomatoes, a few different kinds of peppers, along with a cucumber or two, is a common and much-welcomed gift during these summer months. Did you really need instructions? 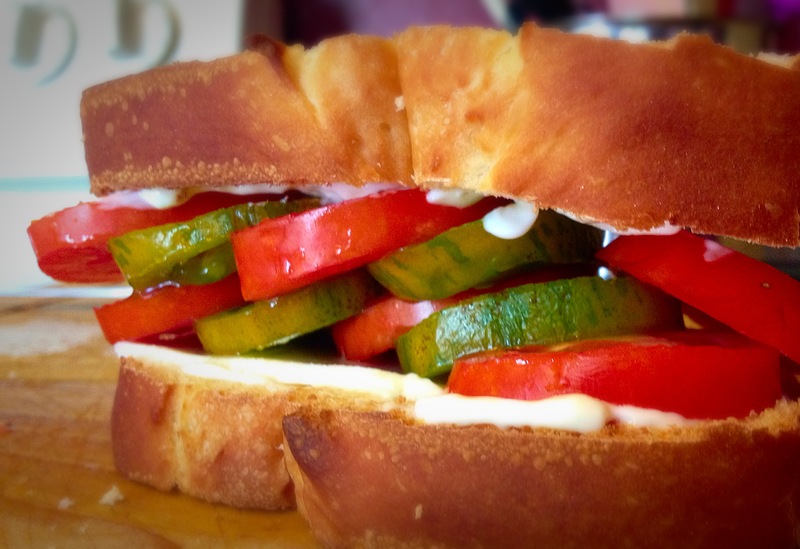 For this particular sandwich I used a variety of Roma tomatoes and a unique Green Zebra Tomato. Although green, they are ripe and have a sweet and tangy flavor. This entry was posted in Breakfast/Brunch, Dinner, Food, Munchies, Sandwiches, Vegan/ Vegetarian and tagged garden tomatoes, green zebra tomatoes, home grown tomatoes, ripe tomato, southern tomato sandwich, tomato sandwich. Bookmark the permalink.